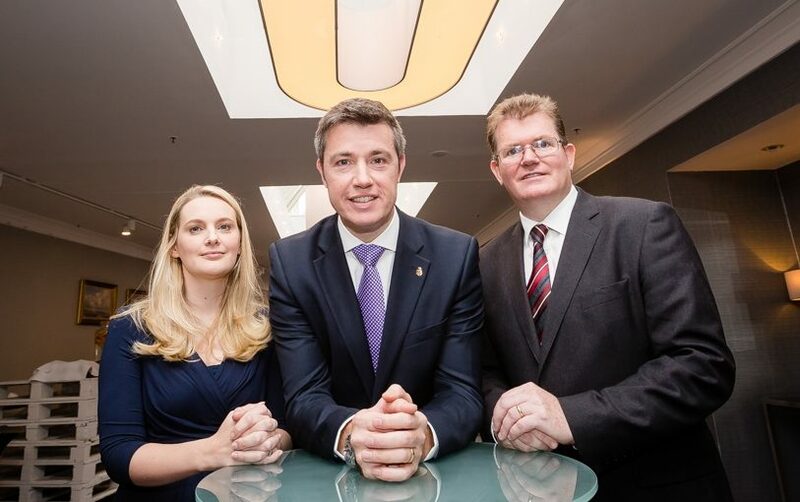 Speakers: Kirsty Rothwell, Director, Cushman & Wakefield and Aiden Murphy (right), Partner, Crowe, with guest speaker JP Kavanagh, General Manager, The Shelbourne Hotel. Crowe and Cushman & Wakefield hosted a joint breakfast briefing on the Irish hotel sector in the Conrad Hotel on Wednesday 3 October 2018. The theme of the event was The Irish Hotel Sector – What’s Next? which looked at current trading performance and the outlook for the sector to 2020 and beyond. Speaking to over 180 industry guests were Kirsty Rothwell, Director, Cushman & Wakefield, and Aiden Murphy, Partner, Crowe. Special guest speaker was JP Kavanagh, the recently appointed General Manager of the Shelbourne Hotel. The full presentations can be downloaded below. Kirsty Rothwell of Cushman & Wakefield commented that market has only seen €79m in hotel transactions in the first nine months of 2018, compared to €88m in the first nine months of 2017 and €291m in first nine months of 2016. This drop in volumes is due to the limited stock available rather than any decrease in demand – which remains as high as ever. She also commentated that the market has seen a number of new entrants seeking well-located hotels which further cements the continuing challenge for stock. 73% of the investment in the sector YTD in 2018 has been foreign capital. Finally, Kirsty commentated that recent headlines overplay the amount of new hotel development within the Dublin market. The hotel sector still faces stiff competition from alternative uses for prime locations and only approximately 24% of the total number of bedrooms within the planning system are currently under construction. Crowe Partner, Aiden Murphy discussed the trading environment for the hotel sector and specifically the impact of new supply or a VAT increase on Dublin hotel profits. Hotel profits look set to continue their growth for 2018 as additional supply has little to no effect on hotels due to existing pent up demand in the market. 2017 hotel occupancy levels in the capital were at 83.5% – the second highest city in Europe. However, over the next two years we should see a fall in hotel occupancy levels as they face the challenge to maintain and grow profits as hotel capacity is increased by 27%. Aiden warns that the next three years will be a period of adjustment for the Dublin hotel sector where demand continues to grow, but the concentrated delivery of new supply is going to have an impact on profit levels. Following seven years of solid profit growth in the Dublin market, hoteliers need to be mindful of this new dynamic and plan accordingly by setting rates, forward selling inventory and being patient while the market absorbs the new supply. Aiden would not be surprised to see VAT for accommodation and food to be increased from 9% to 11% in the upcoming Budget. This adjustment was widely expected in last year’s Budget, but was ruled out on concerns of the potential negative impact from Brexit on for the tourism market. It is now somewhat ironic that 12 months on, when Brexit is more of a concern and the prospect of a hard Brexit is more of a reality, that the Exchequer is targeting the hotel sector to balance the books. If the Exchequer believes the appropriate rate is 11%, Crowe suggests that Revenue announce the measure but defer the increase by another 12 months to allow for the industry to understand the full impact of Brexit and hotels to renegotiate their contracts with customers which are often set 12 to 15 months in advance. JP Kavanagh, General Manager of the Shelbourne Hotel, gave attendees an overview of his long and varied career and his plans for Dublin’s flagship hotel The Shelbourne. JP spoke about how well Ireland is perceived abroad. He outlined that at tourism fairs abroad, it was the Irish Tourism stand which would always have the biggest buzz around it. He tells the story of Donald Trump’s Chief Investment Officer, after one such tourism gathering in Scotland, ringing Trump to tell him “Mr Trump we have invested in the wrong country”, which potentially led to the investment in Doonbeg resort by Trump International. Finally JP outlined that the Irish hotel sector sells an experience, not a commodity, and the customer experience we can offer in Ireland is second to none. But to deliver this experience we must continue to invest in our people as it is our customer service that will ensure we maintain the demand and profitability levels the sector currently enjoys. For more information about how Crowe’s dedicated hotel, tourism and leisure group can assist you contact a member of our HTL team.